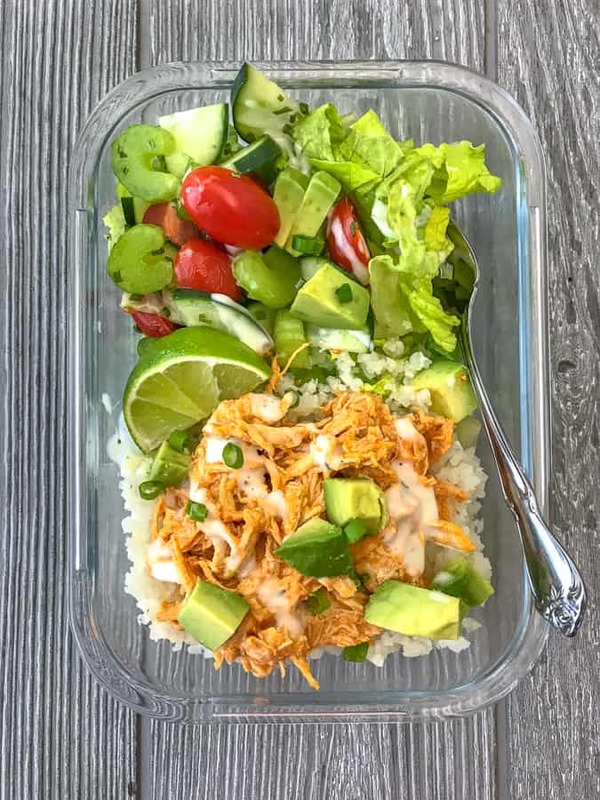 Instant Pot Buffalo Chicken Meal Prep – an easy and quick way to make your favorite shredded buffalo chicken – in the Instant Pot! This chicken comes out tender, juicy, and beyond flavorful. 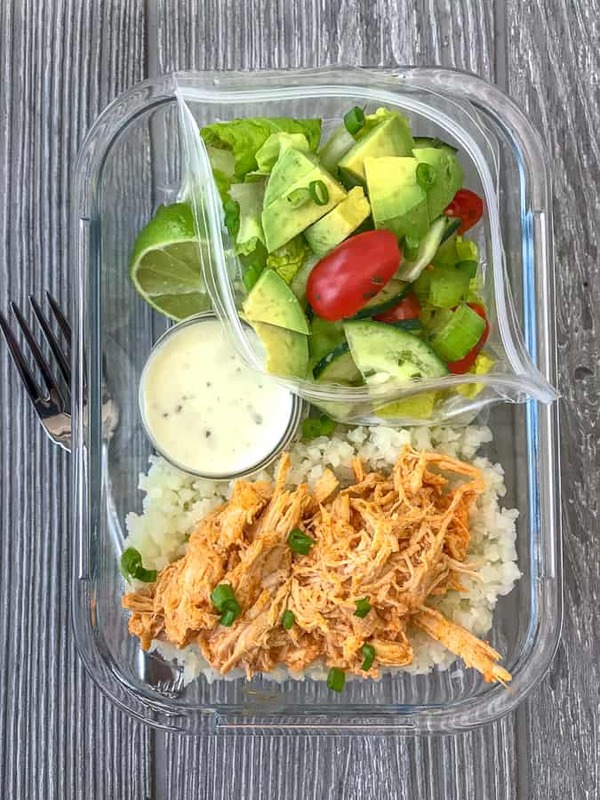 Cauliflower rice, shredded buffalo chicken, and an easy side salad make for a great Keto, Low-carb, high-protein, or paleo diet meal prep option. 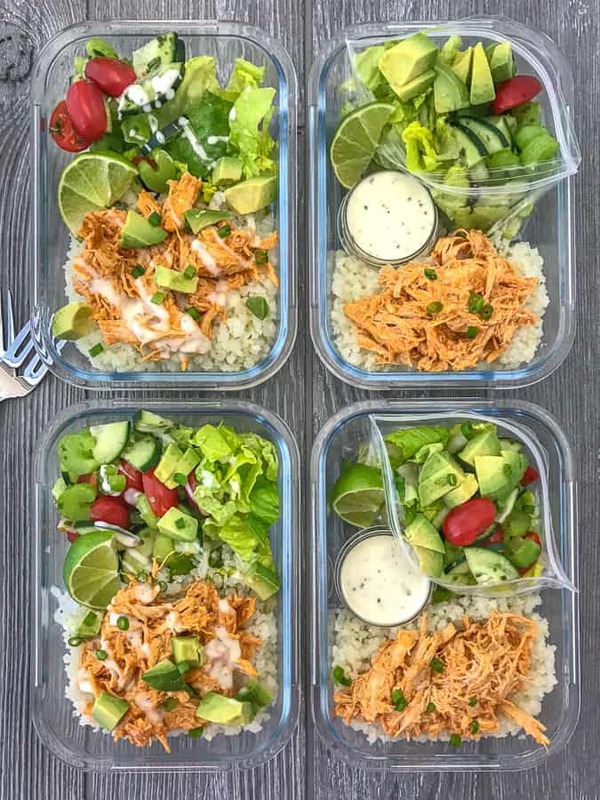 This recipe and entire meal prep comes together in less than 20 minutes, making it perfect to make for lunches, if you’re on a time crunch, or if you’re making various meal prep dishes. 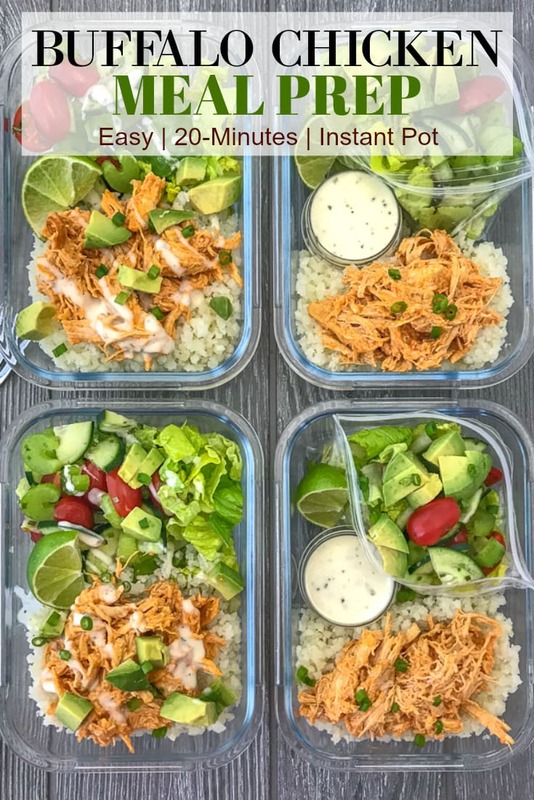 Delicious, healthy recipes like this or my Instant Pot Chicken Noodle Soup and Skinny Taco Salad – Meal Prep are lifesavers for busy weeks! Sadly, life has yet to settle down post-holidays and New Year, hence my current obsession with prepping meals ahead of time. I have become heavily dependent on having lunches and items prepped ahead of time so that my week runs smoothly. And when it’s finally time to rest that hour before bed, I don’t have to worry about whether my husbands lunch is prepped for the next day. Because it’s done for 3-4 days! Meal prep bowls, snack packs, and such are my go-to when I am facing a busy week ahead, am stressed out and have no cares to think about what to eat, and for when I’m running out the door. Can anyone relate?? CHICKEN: Buffalo style! Who else is as obsessed with buffalo chicken as I am? Its great cold or hot and is absolutely scrumptious with just about anything! 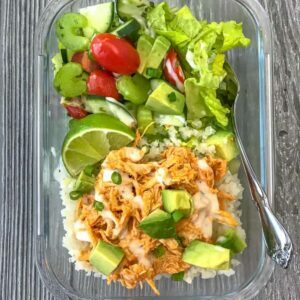 This Instant Pot Buffalo Chicken is made in around 20 minutes in one pot. It comes together easily, effortlessly and without much thought! It’s one of those recipes you can set and forget! CAULIFLOWER RICE: You can make your own Cauliflower Rice, in which you can learn how-to make and freeze, or you can skip a step and use frozen pre-riced cauliflower. LIME WEDGES: Don’t forget to add just a touch of extra flavor when you eat this with a squeeze of one of these wedges. YUM! DICED AVOCADO: It adds some healthy fat to the dish, as well as the perfect creamy texture needed. Add it to your salad or overtop of the buffalo chicken and cauliflower rice. SIDE SALAD: Because what is a balanced meal without some extra vegetables?? You’re going to want the crunch with your meal. Promise. RANCH DRESSING: To drizzle over the top (along with diced scallions) of both the buffalo chicken and the salad. Double score! Or you can sub with buffalo cheese or dressing of choice. This dish can be served hot OR cold. I don’t mind cold dishes (hello, I’m a food blogger – used to eating cold foods! ), like leftover cold pizza, cold grilled chicken, etc. If you’re not strange like me, then I would recommend storing the salad in a disposable sandwich bag or eat it first prior to heating the chicken and cauliflower rice. I recommend dicing and adding the avocado prior to eating it. Although, I do find that drizzling lime juice over the top of avocado helps to slow down the oxidizing process that causes it to brown. Store the dressing in re-usable salad dressing containers to keep it separated. They also work great for sauces, nuts, seeds, or garnishments! I recommend meal prepping with re-useable meal prep containers that you can use for cold or hot meal prep (no heating plastic or adding to the landfill!). I also love divided glass meal prep containers, which are great if you want to keep wet and dry ingredients from mingling. To the Instant Pot, pour in the buffalo sauce, minced garlic, salt, and stir. Add the chicken breasts and flip to coat both sides. Add 2 tablespoons of water and seal the lid and cook on HIGH for 10 minutes with a 10 minute natural release. While the chicken is cooking, heat the cauliflower rice in a skillet over low-heat. Season with salt, pepper, and garlic powder (all to taste). Stir well. Cook 3-4 minutes. Or microwave according to package directions and season post-cooking. Do a quick release to remove any additional pressure that may reside in the pot and remove the lid. Remove the chicken breast from the pot and shred using two forks. Set the Instant Pot to ‘Saute’ and add the cream cheese and stir as the cream cheese begins to melt. Once melted, return the shredded chicken to the pot and stir to throughly coat. Saute for a few minutes, stirring occasionally, to allow the chicken to absorb some of the sauce and for the sauce to thicken. 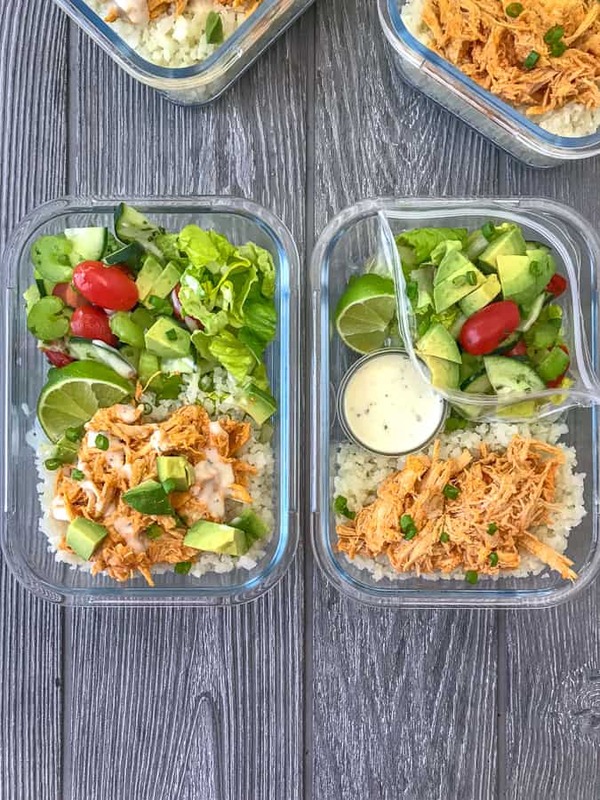 Turn off the Instant Pot and assemble your meal prep containers, keeping in mind that it may be best to add the salad after the rice and chicken have cooled slightly. 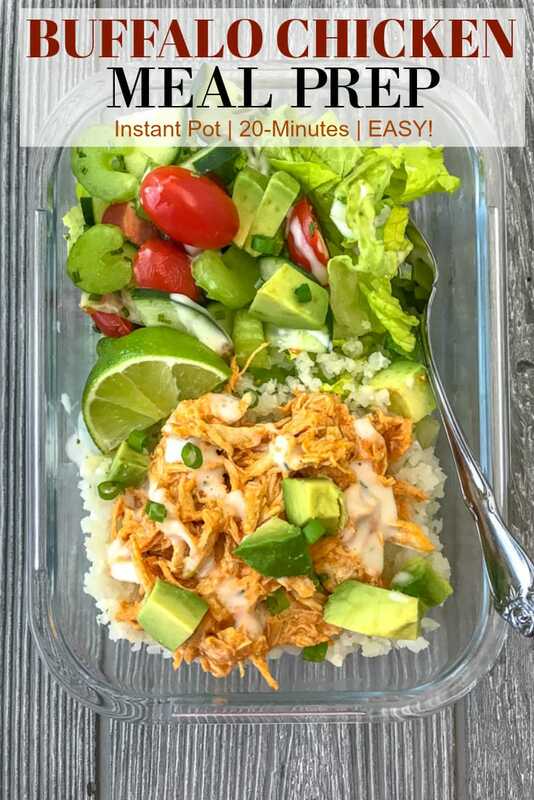 Keto, low-carb, protein and veggie packed, paleo-friendly meal prep option that is very easy to make and full of flavor! Great for on-the-go, for lunch, or as a post-workout meal. Add the buffalo sauce, minced garlic, salt and pepper, and water to post. Stir to combine. Add the chicken breast and flip to make sure each side is coated in sauce. Add the two tablespoons of water. Seal the lid and valve and cook on HIGH pressure for 10 minutes with a 10 minute natural release. While the chicken is cooking, heat the cauliflower over low-heat in a nonstick skillet. Season with salt, pepper, and garlic powder - optional and all to taste. Cooked 3-4 minutes or until cooked through. Remove from heat and set aside. Do a quick release on the Instant Pot to remove any remaining pressure. Set the Instant Pot to 'Saute' and add the cream cheese, stirring consistently until melted. Add the chicken back to the pot and stir to thoroughly coat. Saute 3-5 minutes or until the sauce has thickened and the chicken has absorbed much of the sauce. Assemble your meal prep containers. Add the salad to the container or into a sandwich bag to remove from the container to heat. Serve with freshly diced avocado and ranch dressing (or dressing of choice). SAUCE: Be patient. The sauce will thicken and the chicken will absorb some of the liquid and sauce as it sauté's, as well as sits. Just make this and my boys love it, came out perfect. I’m so glad to hear you all loved it so much! Thank you for the feedback. I truly appreciate it!